Summer has just begun and it’s already a scorcher! We’ve had above normal temperatures since April 26, according to the National Weather Service. Highs have been 90 degrees or above since May 30 (except for a slight dip to 88 on June 1). The heat index has been 100+ degrees most days. Last June was even hotter. Record temperatures were set on June 22, 2009 in Miami with a high of 98. Fort Lauderdale had a high of 100, tying an all time record. This summer feels hotter because temps have consistently been at 90 or above for 59 days and counting, while last summer temps were mostly in the high 80s with a few spikes in the 90s. The last picture I took before getting chased off by a hot and cranky bee. This crazy heat has an effect on livestock at Bee Heaven Farm. Chickens stand with their beaks open, panting, and hold their wings out a bit to their sides to try to cool off. Bees don’t like heat and get cranky. 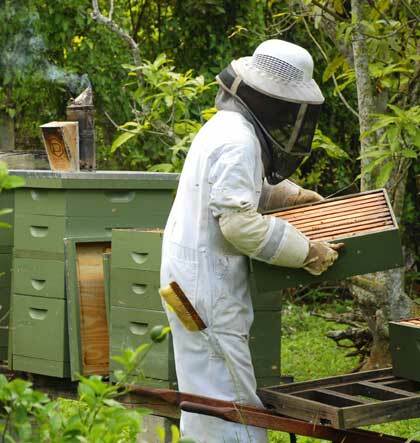 I passed by the hives when beekeeeper Miguel Bode was working with them a few weekends ago. One bee took offense to where I was standing, buzzed around my head, and chased me for a good distance. Lucky for me, I didn’t get stung but it felt close! Even the worms in the vermiculture bin have been suffering mightily. Instinctively they’ve dived down to the bottom of the bin, seeking cooler soil, but hit bottom instead. The Worm Guy (that’s what Margie calls him) advised chilling them down with frozen water bottles buried in the bin. Wigglers on the rocks, anyone? I asked Farmer Margie what grows well in this kind of heat. “Weeds!” she exclaimed. Those weeds completely took over vegetable beds after Gleaning Day. Margie mowed them down, and now that she’s had two days without rain, she’s out on her tractor tilling the soil, preparing to plant cover crops. Some summer fruit is finally starting to get ready, but running a little behind schedule because of the freeze this winter. The extended period of super cold weather caused plants to go dormant for weeks. Lychees (Mauritus variety) are bearing late this year. 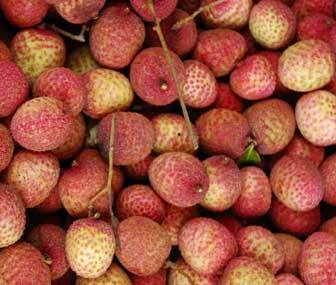 Margie pointed out that last year, a bumper crop of lychees were harvested in late May. This year the harvest began in mid-June, and the quantity isn’t quite as much. Mauritus lychees from last summer. Another casualty of the cold are mango trees which were in bloom in January when the freeze hit. The long stretch of freezing temperatures damaged blossoms. Some fruit set and grew, but then aborted and fell off. I’ve seen trees that don’t have as much fruit, and if they do, they’re not as plentiful and not as big or developed. Avocado trees seemed to escape significant damage from the freeze in January. Branches are loaded with fruit several inches long, about the size of Haas avocados in the groceries. 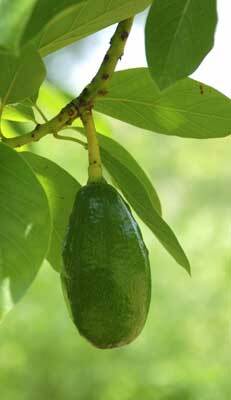 If you’re not familiar with Florida avocados, and you have a tree in your yard, don’t get confused and pick early! The varieties that grow here, especially the Donnies that Margie raises, get much much, much bigger than the Haas variety from California or Mexico. Last summer many Donnie avocados weighed in at 3 pounds apiece, and one giant weighed 4 pounds. Avocado picking will start in mid-July, also several weeks later than last summer. Hi Nadia, yeah the Haas avocados are just too little and too oily for my taste. No comparison to Florida grown! You can buy Margie’s avocados directly from her this summer. Get on her mailing list to find out when. In the past, Whole Foods bought local avocados during season, and they might do so again, so keep your eyes open. Publix participates in state ag department’s Redland Raised program, so local avocados may start showing up in your neighborhood store, too. Ask the produce manager for local fruit! How frustrating! Too cold, too hot…this year has been something else. Sorry to hear to it, but certainly seems as if you know how to handle it. Marian, does the “worm guy” have a website or contact info? I am interested in buying some red wigglers for my compost. There are a number of worm suppliers in the state of Florida. We got our last batch of worms from: Our Vital Earth. Contact is Joe Cifrian 800-237-4780/407-754-8921. Email: carl@ourvitalearth.com. They’re out of Apopka. Ask them which type of worm(s) is best for your composting setup. Tell ’em Margie from Bee Heaven Farm sent you! Hey there. Just wanted to say thanks for writing this blog. I’m hoping to start with the Redland CSA this year. I signed up for the alert to come out in July. I’m also planning to start a garden this September, so having info about local produce is very helpful. THANKS! That’s great that you want to start your own garden! Get in touch with Melissa at Urban Oasis Project. They’re a group of avid food gardeners who hold monthly potluck meetings, and put in gardens in underprivileged neighborhoods. They can help you set up your garden and decide what to grow. Just so that you’re perfectly clear — this blog is written by me, Marian, a CSA member who is also a writer and photographer, but not a gardener or farmer. Sometimes I get mistaken for Farmer Margie, who owns Bee Heaven Farm, runs the CSA, and has her own blog, the Bee Heaven Farm blog. She would be the person who will send out the email alert in July to sign up. Thanks for the tip on Urban Oasis, and yes, I more or less understood you were a CSA enthusiast, and not Farmer Margie herself. Lovely lychee photo! It is incredibly hot, and where’s the rain to make this the “rainy” season??? But with a bit of help from the garden hose, we’ve got field peas (Mississippi Silver Hull crowders, and Pinkeye Purplehulls) and also Seminole Pumpkin and Asparagus Beans doing quite well in the garden. It’s also a good time to plant turtle beans, okra and sweet potatoes, and yucca, boniato and malanga if you’ve got the space. So the season is not lost, if you want to push it. Just don’t forget the sunscreen!